A special hour-long episode of the Emmy Award-winning series "Bear in the Big Blue House" from Jim Henson Television, illustrating for young viewers and their parents/caregivers how a community comes together to cope with unexpected adversity, will be presented each day, Monday, September 9 through Friday, September 13 (1:00-2:00 p.m., ET/PT), during Disney Channel's learning-based programming block for preschoolers, Playhouse Disney. Rich Ross, President, Entertainment, Disney Channel, said, "Preschoolers and parents have come to depend on 'Bear' to help decipher a world that is always new and often challenging. During these times of uncertainty, we thought that this special episode which focuses on community response to unexpected trauma would be a helpful tool for kids and caregivers alike." Mitchell Kriegman, executive producer and creator said, "When we started the new season of Bear, September 11th happened and we just couldn't avoid thinking about how it might affect children. The Big Blue House is the ultimate safe haven for kids and we thought it would be the ideal setting to address some of the fears and concerns they might have. This one-hour special introduces Bear's world -- the town of Woodland Valley -- and creates a safe and engaging parable for kids about September 11th, addressing how communities come together when times are difficult." "As a leading producer of children's educational programming, we hope that this very special episode of 'Bear in the Big Blue House' will prove to be a useful tool for both parents and educators in continuing the healing process among America's youth," said Juliet Blake, President, Jim Henson Television, US. The series features Bear, a seven-foot, warm and understanding bear who invites the audience into his home each day to play, learn and sing with his friends. The one-hour special episode entitled "Welcome to Woodland Valley" (Part 1 and Part 2), depicts how Bear's community unites to help make it better and stronger after a storm causes a big tree to fall into the local library. 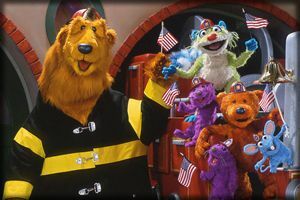 Bear (a member of the Woodland Valley Volunteer Fire and Rescue Company) hosts a town meeting at the Big Blue House where Doc Hog, Tutter, Ojo, Pip & Pop and other members of the Woodland Valley community, plan to rebuild the library. Through it all, they reassure each other that everything will work out for the best. Brad Garrett ("Everybody Loves Raymond") and comedian Gilbert Gottfried provide the voices of possums that live in the tree and are affected by the damage to their home. For the first time since the series premiered in October 1997, viewers will see Bear visit other locales in Woodland Valley including the General Store and Post Office, the Movie Theatre, Fire Station and Library. Additional upcoming episodes of "Bear in the Big Blue House" continue the theme of community and heroes with stories about volunteering, charity and bravery. Designed to help preschoolers "imagine and learn," Disney Channel's Playhouse Disney incorporates a range of child development strategies with an emphasis on both emotional growth and cognitive development. The purpose of this "whole child" approach is to be responsive to young kids' curiosity, concerns and creativity in order to support parents' efforts to raise happy, well-rounded children. 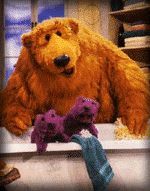 "Bear in the Big Blue House" in particular has a focus towards social and emotional learning in family and community, and reinforces creative/artistic strengths through its music, puppetry and live action. The curriculum advisor to "Bear in the Big Blue House" is Tina Grotzer, Harvard Project Zero, Harvard University Graduate School of Education. The executive producers are Mitchell Kriegman and Alex Rockwell. "Bear in the Big Blue House" is a Jim Henson Television production in association with Shadow Projects. The Jim Henson Company, an established leader in family entertainment for more than 45 years, is a multimedia production company; one of the top character licensors in the industry; a leading publisher of children's books and home to Jim Henson Television, Jim Henson Pictures, Jim Henson Interactive, Jim Henson Home Entertainment and Jim Henson's Creature Shop. The Jim Henson Company is a wholly owned subsidiary of EM.TV & Merchandising AG based in Munich, Germany. Disney Channel is the first general entertainment television network designed for kids and families. Currently available in 80 million homes, Disney Channel is a division of ABC Cable Networks Group, a subsidiary of The Walt Disney Company.